Jeff Zelevansky/Getty Images Claudio Reyna's mission: Get the chaotic, culturally diverse American soccer community to agree on a few basic principles of player development. BALTIMORE -- In the ballroom of the Baltimore Convention Center, nervous soccer players of varying backgrounds smiled and held up scarves for the teams that had just picked them in the MLS SuperDraft. 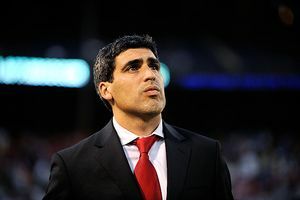 At the same time, one floor below at the National Soccer Coaches Association of America convention, Claudio Reyna, Youth Technical Directo for U.S. Soccer, guided a packed room of soccer coaches through a new U.S. Soccer curriculum geared toward a specific style of fluid, fast play. Reyna's challenge: Can he and the federation get the chaotic, culturally diverse American soccer community to agree on at least a few basic principles of developing soccer players? Should they even try to get all American players, regardless of background, to play like Barcelona? Among the skeptics in the ballroom was Bruce Arena, who coached Reyna at Virginia before coach and player went on to successful careers on the pro and international stages. "A curriculum's not going to make us any better," Arena said. "If that was the case, we'd all publish curriculums. This country, I've always said, is too large, too different to have one style of play. If he [Reyna] can get that accomplished, more credit to him." Akron coach Caleb Porter, who saw five of his players be drafted in the top eight picks, was more enthusiastic. "I spoke with Claudio over Christmas," Porter said. "He liked the way our team played. I'm going to try to get involved in helping to spread that same philosophy and same vision." The Reyna/U.S. Soccer vision fits nicely with what soccer fans, coaches and players want to see -- quick play, with one to three touches before moving the ball to players actively looking to receive it. That approach works for Barcelona. Of course, Barca has some of the best players in the world. But can their style of play work in a country with so many different approaches to the game? "It depends on what you mean by 'try to establish a style of play,'" said New England coach Steve Nicol, the Liverpool legend who has mastered the art of scouting and developing players from college campuses. "We all want to pass the ball, and we all want to play good, open attacking football. If we can develop players to have that ability, the style will evolve on its own. What we'll have is players who can play the game properly." 1. "Overdribbling." Reyna repeatedly used this word to warn against holding the ball too long, saying that's simply not what works among elite clubs. Some coaches and journalists seemed skeptical. Aren't Americans typically lacking in ball skills? And aren't we supposed to at least teach young kids to be comfortable on the ball and not afraid to take on defenders? 2. Winning vs. development. Before Reyna's session, Wake Forest coach Jay Vidovich's "Playing to Develop vs. Playing to Win" session was less of a philosophical discussion than a showcase of what works and what shouldn't. Vidovich told fellow coaches that his program, which has produced dozens of pros, emphasizes developmentally friendly soccer. Top draft pick Omar Salgado, only 17, spent time in youth systems in Mexico and the U.S. and sees one major difference. "They're both equally professional," Salgado told reporters at the draft. "In the USA, they're always wanting to be No. 1." 3. Too many paths to the top. Young players are pulled between competing clubs with different approaches. Teenagers may find club coaches who want to keep them away from high school games. Then elite players run into the alphabet soup of organizations -- Super-Y, ODP, NCAA, USYSA, ECNL. Second-round pick Michael Farfan took an especially circuitous path to being drafted -- U.S. Under-17 residency, Cal State-Fullerton, North Carolina, overseas training and several youth and Premier Development League (PDL) clubs. He doesn't think the exposure to different schools of thought will hurt young players. "I'd say it's more of a positive," Farfan said. "It helps show your versatility so they know you can play different positions and you're open-minded." The U.S. Development Academy, a youth league with teams that are affiliated with most MLS clubs along with many longtime youth powerhouses, seeks to simplify things. Each team plays official games only in academy competition, not in state cups or other tournaments, and players can't play for other clubs other than national teams or high schools. Through the academies, MLS is providing a path for players to bypass college by signing directly with the senior teams. But for all the dirt tossed on college soccer's supposed grave over the years, MLS doesn't see that development path drying up. "We're recognizing that it's a dual approach," MLS commissioner Don Garber told reporters at the draft. "It's developing players in academies and the college system, including potentially the college system in Canada. I think there is room for both the college game and the academy. Some kids may not have the opportunity to be pro. It's great to get a college education, particularly one with a scholarship." And Porter, fresh from coaching Akron to the national championship and bidding farewell to his players as they start their pro careers, is bullish on U.S. Soccer's "E Pluribus Unum" approach. "Our country's unique because we've got a lot of different types of ethnicities," he said. "We've got to figure out what system is the best and what style is the best. Maybe it's a hybrid of a couple of different countries. You look at Brazil, you look at Spain, you look at Germany -- they have an identity, and it starts from the bottom up. We need to start to develop that, as well. And I know that we will. Claudio Reyna's going to do great things." Beau Dure is author of "Long-Range Goals: The Success Story of Major League Soccer."